Ever have one of those days, where things just startle and scare you? It began during our early morning run - Julia and I both jumped when we heard something rustle behind us. Turns out it was a heavy piece of plastic that was put out for the trash. Then, a few minutes later, the street light cast our shadows in front of us and I saw something move right next to me and I jumped (but didn't scream, which is unusual for me, lol). I quickly realized it was my running skirt making that movement. Then Julia started questioning if the streets were darker than usual, and suffice it to say that our run, which was speedwork anyway, became particularly fast. So yeah, you could say we were on edge. Later on, I had a meeting to go to at night. Now, when I know I'm coming home to an empty house, I leave the lights ablazin' both inside and out. And I make sure to tell Paco to guard the house (instead of going to hide in my closet, which he is known to do when I leave). But when I came home, I was still feeling a little jumpy, so instead of putting Paco in his crate for the night, I had him sleep on the bed with me. You'd think that having nearly 30 pounds of dog laying on my legs (his preferred spot) would have meant a night of bad sleep, but nope. I slept like a rock. Best sleep I've had in a long time, in fact. I knitted another cowl - what can I say, this winter is the season of cowls for me, apparently. Not only are they great for keeping me warm (but not too warm since the heat is concentrated on my neck and chest area), but I love all the different colors and styles of my cowls...I feel slightly fashionable when I wear one. This one was a new design by Liz Abinate, who also designed the Saroyan shawlette that I knitted last fall. Her patterns are very clear and well-written, and I really enjoy knitting them - I can safely say I've had no frustrating, want to throw the piece across the room moments while knitting her designs. The pattern called for a little more than one skein of yarn, but I decided to go for broke and make it with one skein...which is mostly because I only HAD one skein of the yarn I wanted to use, but also, I figured I'd get pretty close. Turns out, I managed to do 16 out of the 17 pattern repeats, so I was right, woohoo! Pattern is Forest Park Cowl, yarn is Madelinetosh Vintage, colorway is Fragrant. I went with the pink tones because of the heart-looking design in the cables, and because I started knitting this just before Valentine's Day. I like how the pattern flares out - this makes it drape nicely, without having to fuss too much with arranging it. Hopefully I'll get a picture of me wearing it soon so you can see what I mean. We have running plans tomorrow - first, of course, will be running. I'll be doing my last week of my 3 mile experiment. And later, several of our JFR Crew have plans to watch a movie about running - McFarland USA. Should be fun! yet. Have fun with your run tomorrow. Have a great weekend. That's too bad about your town changing so much. But I suspect too many tourists add to the "not safe" feel, unfortunately. You should make a cowl - they're pretty easy, especially if you've ever knitted a hat. Love your knitting. I've never made a cowl. I think I need to. It is so cold here!!!!! I love that cowl. Yes, I want to see a picture of you wearing it! I am knitting a pink cowl too--with that beautiful light pink alpaca I got when I was with you! 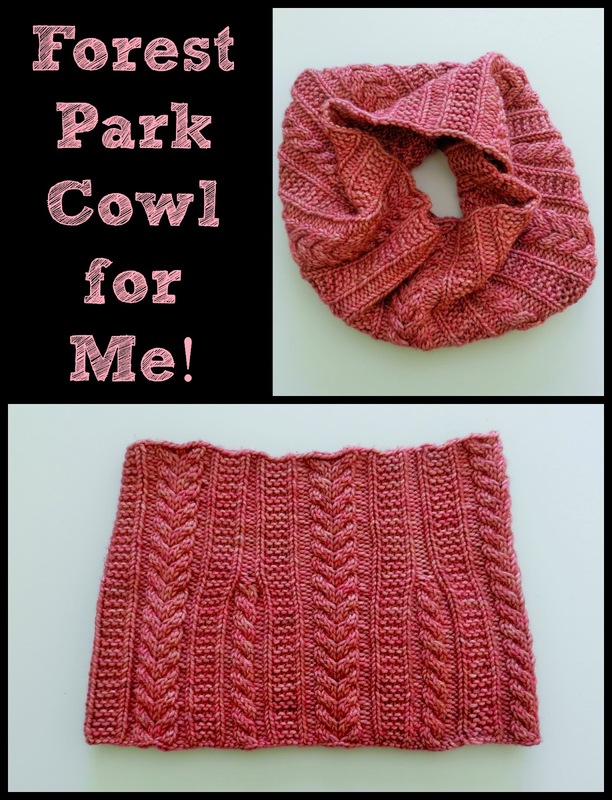 How funny - I guess February is the month for pink cowls! Can you imagine the two of us together in a frightening situation? We'd be freaking each other out so bad!!! I hate periods of paranoia like that. I am a 'gasper', which I think drives John nuts, especially because it seems like he is always the one startling me. That cowl is very pretty. In a few years, you will be able to open up a shop with all your knit things. Oh yeah, Jeff startles me on a regular basis. Woe be it to both of us if I'm vacuuming and he sneaks up on me, LOL. No knitting shop for me - it would take all the fun out of it if I had to produce items on a schedule. As you know I too run mostly in the dark. Generally I'm fine but once in a while I just get uncomfortable. I've actually turned around and gone home to run on the treadmill if I had too strong a sense of discomfort. I am so longing for beautiful sunrise runs right now! McFarland got good reviews by the movie people on my morning. I am going this afternoon to attempt to secure us seating at the fancy theater so we can go to a movie tomorrow as well. I'm tired of being cooped up and another storm is coming tomorrow afternoon. Sigh. I startle easy too. Have you read my post about a deer crossing my path and making noise at me? Have fun this weekend. I heard that's a great movie. I haven't read that post - link? I hate when you feel edgy and are always looking over your shoulder. And that cowl? GORGEOUS!!!!!! Have a good weekend Shelley! And we always leave a light on when we have to go away at night, we don't want Bella to sit in the dark. Love the cowl, you are such an experienced knitter now with all the patterns you are making. Love it. Hope you have a great run today and have fun with your friends at the movie. I can't imagine feeling so safe. You are really lucky to live where you do. Oh yeah...that'll do it to me, too. Ever since having my house be broken into twice (2 separate houses!) while living in England, I am super jumpy! So I definitely can relate haha. I love the cowl! I am going to attempt making one! What needles did you use? I used size 8 circular needles - 24 inch length, I think. You should make this! I'd be jumpy too if my house had been broken into...yikes!